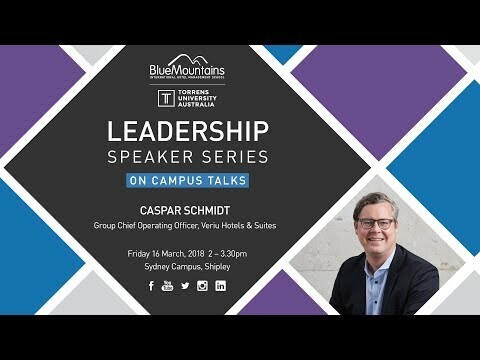 Our Leadership Speaker Series (LSS) creates panel discussions for BMIHMS students to learn and engage with those at the forefront of the hospitality industry. Hospitality professionals discuss current trends within the sector, while providing an open Q&A forum, giving students the chance to gain greater insight into possible future career paths from those leading the field. 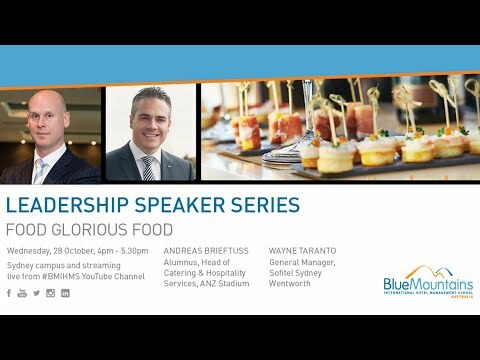 Find out more about the world of hospitality from a variety of leading industry experts by viewing some of our previous LSS events below. Peter Tudehope, is an award-winning General Manager of Radisson Blu Plaza Sydney, and is celebrating over 10 years with the hotel. Peter is also Regional Manager Australia and Pacific of Radisson Hotel Group, Asia Pacific. Peter has an extensive background in hotels. He was Director Operations & Services for Radisson Hotel Group Asia Pacific. 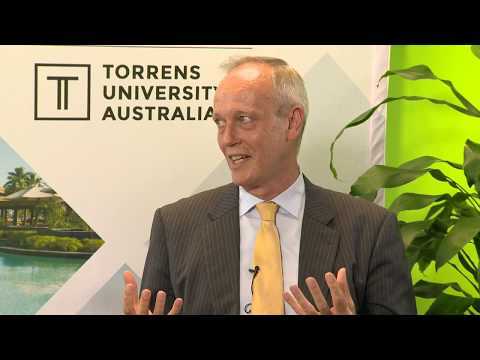 Peter is also Chairman of the Accommodation Board for Tourism Accommodation Australia (TAA) for NSW. With over 20 years of hospitality experience, Caspar brings an open, balanced and holistic leadership style into businesses. As a leader, Caspar is a key advocate of emotional intelligence. Regarded as an enthusiastic goal orientated team motivator, a people & talent developer and a great driver of revenue, Caspar understands the “why” and ethos of the businesses he works with. He builds strong internal and external relationships to stay agile, inspired and on the forefront of hospitality. Strategising, supporting, and leading the process of accelerating growth always drives teams to challenge the process, review the markets they are in and to achieve sustainable growth. 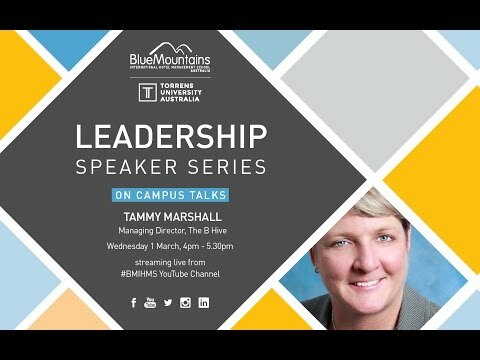 Tammy Marshall’s career ambition is to enable global companies to pivot, transform and capitalise on rapid growth opportunities. With over 25 years experience in travel and tourism, Tammy has a proven track record in establishing strategically aligned brands, cultures and operating models that exceed revenue and EBITDA targets, year on year. From as early stage of her career with Contiki to Tammy’s last role with TFE Hotels she has been drawn to challenging, complex roles that require a progressive and change-oriented leadership style to forge paths forward into new territories and markets. She has played a leading role in propelling the Travel and Tourism Sector into its current stage of dynamic modernisation, most notably through her success in launching and embedding experiential travel as a globally relevant offer. 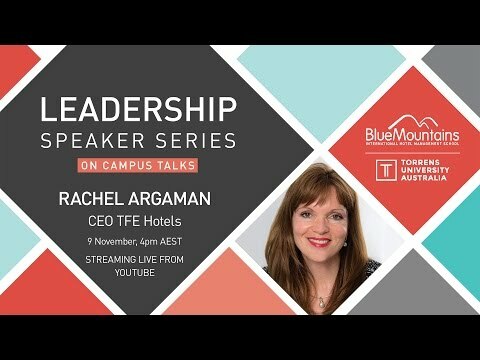 Rachel Argaman, CEO of Toga Far East (TFE) Hotels, and one Australia’s finest business women shares her experiences in the hotel industry. Rachel is a visionary leader whose collaborative leadership style has helped build TFE Hotels (Toga Far East Hotels) into one of the most successful hotel and apartment development and management companies based in Australia. 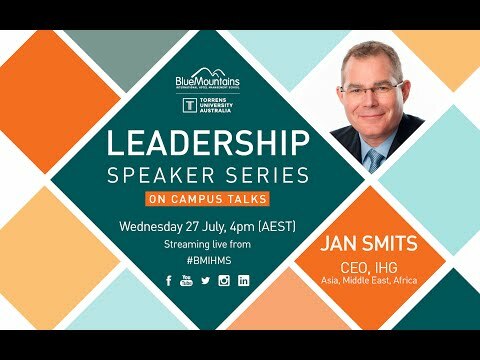 Jan Smits, CEO of the Intercontinental Hotels Group for Asia, Middle East & Africa (AMEA) talks through IHG’s model and strategic approach to growth for the future, the challenges he faces managing teams across diverse territories, how he views disruptive competitors entering the market, and provides advice to students looking to secure their first job upon graduation. Our speaker Mr Loh Lik Peng restauranteur and hotelier, comes to us from Singapore bringing with him a wealth of experience as owner and founder of Unlisted Collection: was started in 2011, totalling 27 properties to date since its first property in 2000. 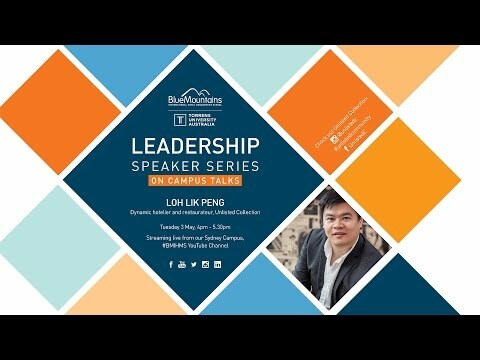 Read about Mr Loh and share this event with BMIHMS. Two hospitality leaders of iconic properties will share their careers and experience in this interactive discussion. Listen to the challenges of operating multi-outlet facilities on a large scale and learn about the challenges associated with managing and operating them. Innovations and the future of the food and beverage industry will be the cornerstone of this discussion. 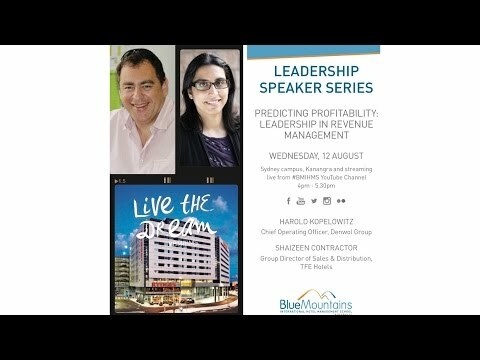 Harold Kopelowitz, Chief Operating Officer for the Denwol Group, and Shaizeen Contractor, Group Director of Sales & Distribution for TFE Hotels and alumnus of BMIHMS, discuss their top ten tips for succeeding as a revenue manager in the hospitality industry. Dr. Juvanka Roberts, Communications and Training specialist and Mathew Stephens, Vice President of eHotelier, share their thoughts on ‘Maximizing Technology to Communicate’. 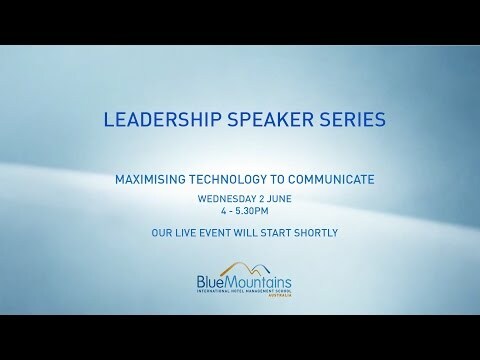 They explain best practices when using technology for communication, and how it can create significant competitive advantages. 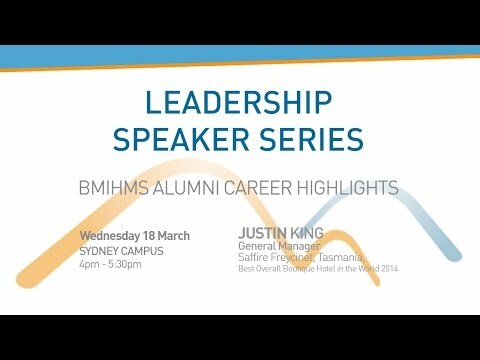 Justin King, BMIHMS graduate and General Manager of the No.1 Boutique Hotel in the World, Saffire Freycinet. (World Boutique Awards 2014) shares knowledge from an international career in Hotel Management that spans countries including Australia, Qatar, Fiji and the UK. He has an extensive career in hospitality, resort and luxury brand management and shares his advice on career options and the industry in general. 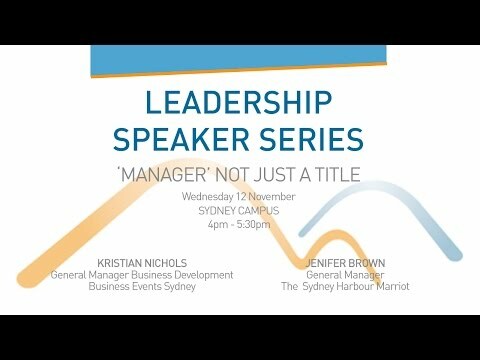 Leading industry experts, Kristian Nichols, General Manager Business Development at Business Events Sydney and Jennifer Brown, General Manager, Sydney Harbour Marriott discuss their individual experiences and how they progressed to their current positions, and offer insights into what it takes to be a successful manager. 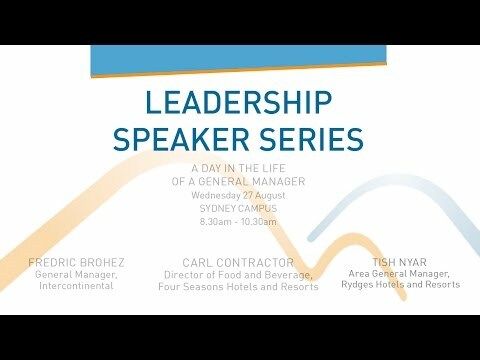 Tish Nyar, Area General Manager, Rydges Hotels and Resorts and Carl Contractor, Director of Food and Beverage, Four Seasons Hotels and Resorts give insider perspectives into what life is really like for a hotel General Manager. They discuss the complexities of their roles and how they successfully reached their current positions.